This morning The Chronicle of Higher Education released an article highlighting slashes that are being made to higher education budgets after recovery-act funding has run out. Collectively, the nation plans to allocate 4% less to higher education than was allotted in 2007. Among those states noted for massive budget cuts, not including the impact of the federal stimulus, are California at more than 13% and New Hampshire at a shocking 41%. The results are staggering across the country, showing an increase in state appropriations in only 9 states. What is more unsettling is the juxtaposition of these appropriations in relationship to the projections of high school graduates across the country. 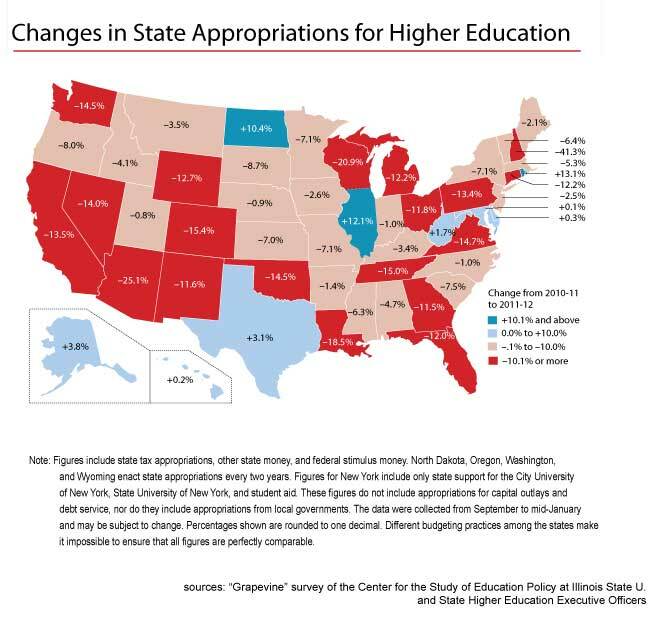 Only 5 out of those 9 states show an increase in funding to help support an increase in high school graduates. What’s more alarming is the budget appropriation cuts of more than 10% in Nevada, Wyoming, and Colorado, states with projected increases in high school graduates of more than 15%. This decrease in spending is sure to have damaging long-term effects impeding institutional advancements and college access for new high school graduates. source: Projections of Education Statistics to 2020. (2011). US Department of Education, Washington, D.C: National Center for Education Statistics.